Video clip synopsis – Joe and Monica Leo embark on a journey to Vanuatu to recover a small part of their past. Broadband MP4 sense_bb.mp4 (15.8MB), suitable for iPods and computer downloads. This interview with Joe and Monica Leo was recorded for the Pacific Stories website produced in 2005. 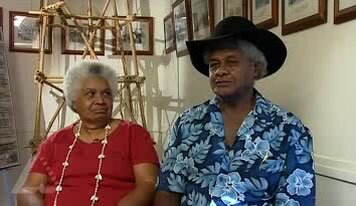 Joe and Monica Leo are the descendents of ni-Vanuatu who helped build Queensland’s sugar industry. Use the issue of Sugar Slaves to investigate a significant Australian event. This clip is directly linked Level 6 Civic and Citizenship domain in which Australia’s place in the Asia Pacific region and the world are examined. Between 1863 and 1904 about 60,000 people from the islands of the South Pacific were transported to Queensland, where they toiled to create the sugar plantations of the far north. While many of the Pacific Islanders were enticed to travel to Queensland, perhaps seeking a better life, others were kidnapped. This human trafficking was euphemistically known as ‘blackbirding’. At the beginning of last century harsh legislation such as the Immigration Restriction Act 1901, known as the ‘White Australia policy’, resulted in the deportation of many South Sea Islanders. A few thousand were permitted to remain and today north Queensland is home to more than 20,000 of their descendants. In the late 1980s, an Evatt Foundation report (initiated by some South Sea Island leaders concerned at the deteriorating social and economic situation of their community), made the Federal Government aware that Australian South Sea Islanders had become a ‘forgotten people’ in Australia’s multicultural society. In 1983 the Human Rights and Equal Opportunity Commission (HREOC) released a report called The Call for Recognition. The Commission’s conclusions included: that the islanders were one of the poorest groups in Australia with a century of racial discrimination and harsh treatment the main contributing factors; that the islanders as a group were in a situation of high need with particular difficulties in respect to school retention, employment skills, home ownership and health; and that the group had been denied government recognition as a distinct black minority group. Among the Commission’s recommendations were that the Government should formally recognise Australian South Sea Islanders as a unique minority group severely disadvantaged as a consequence of racial discrimination, and that Australian South Sea Islanders should be identified as a high-need group in equal opportunity, access and equity programs. In 1994 Australian South Sea Islanders won official recognition as a distinct ethnic group. Since then, there have been efforts by governments to correct the significant disadvantages facing these people. In 2000, the Federal Parliament formally recognised Australian South Sea Islanders as a distinct cultural group. This was followed by a public apology to the Islanders for their decades of mistreatment. Discuss the concept of ‘identity’. The word ‘belonging’ is mentioned many times in the video clip. What does it mean to belong? Using the video clip, what do you think drives Joe and Monica Leo to explore their sense of belonging? Who/what do you identify with as belonging to? Form some small groups in your class. Discuss what it means to be an ‘Australian’. List the characteristics that students believe to be attributes of being an Australian. Why do you think Joe and Monica Leo, when they were younger people, felt isolated in Australia? Is being Australian the same as being an Australian citizen? Present your group’s findings to the whole class. Using an Australian atlas, locate the Pacific Islander museum at Joskeleigh. What role do museums play in preserving cultural heritage of a community? What makes a ‘good’ museum? How is the history of your school preserved? ‘The Sugar Slave period is one we should forget.’ Using this statement set up a debate in your class with groups representing different points of view.